Well, it’s back to 1985 again, and the first IFMAR Off-Road Worlds at the Ranch Pit Shop in Del Mar, California. 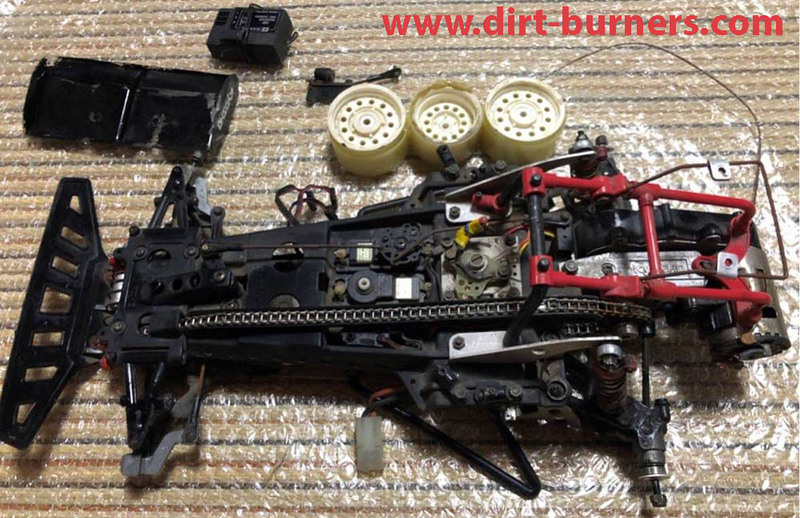 Kyosho had sent a team as a part of the Japanese contingent to these first IFMAR 1/10 scale off-road World Championships, but had failed to bring their brand new Kyosho Optima as their preferred weapon of choice. Instead they had decided to use the 4WDS Progress/Gallop in the Modified class (which later would become the 4WD class), and would wait with releasing the Optima until immediately after the Worlds. The Optima WAS ready to be raced, and the decision not to use it has baffled many people in the years after, including myself. Here they had a brand new race ready car, miles ahead of the competition, performance wise, with a state of the art suspension system that would be the gold standard for electric off road buggies for decades, and still they chose the Progress/Gallop for the WORLD CHAMPIONSHIPS. I mentioned this in my 1985 Worlds article, and I still believe internal politics over at Kyosho HQ was the reason for the decision. Akira Kogawa’s race ready Kyosho Optima, in his trade mark racing colours and Fujiya Model Club markings, eager to take on the world in Del Mar. 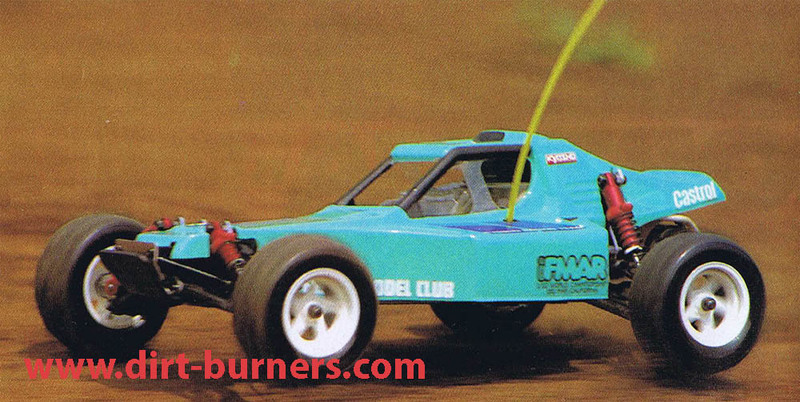 Notice the side decal that says “IFMAR 1/10 World Championships Del Mar California”. 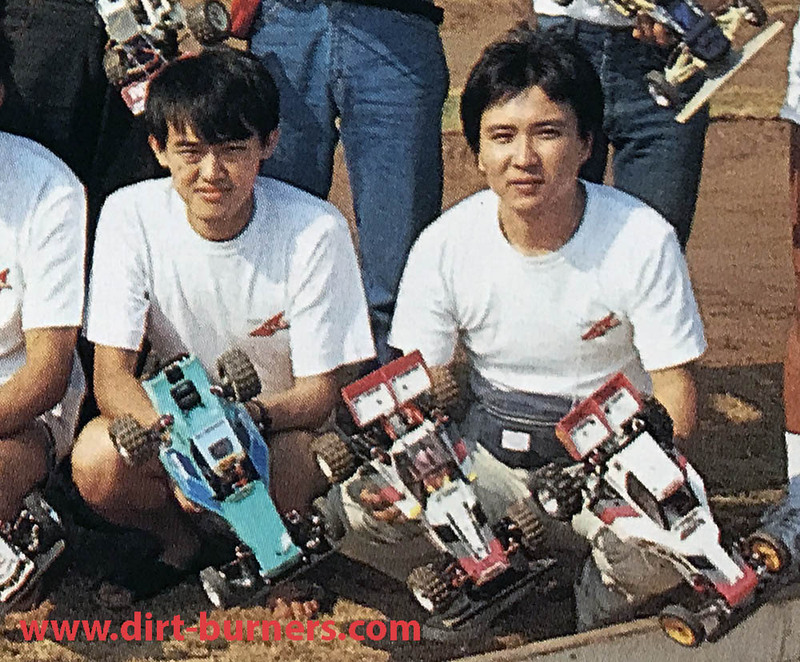 The fact that just two Kyosho drivers, the Progress/Gallop designer Shigeru Hino, and one of Kyosho’s top drivers at the time, Toshifumi Watanabe, chose the 4WDS, while the rest resorted to using 2WD cars in the Modified class, kind of says it all, I think. The other drivers, like Hidetoshi Nagamine, Masatoshi Kobayashi, Kazuhiko Nakanishi, and the Optima and Scorpion designer, Akira Kogawa, all chose cars from the Scorpion series, instead of the 4WDS for the Modified class. Kogawa told me his Tomahawk was quite a handful to master with the added horsepower on the slippery dirt track. What wouldn’t he had given to drive his brand new Optima instead? One of the drivers, Yoshiaki Fujita, even chose his old SRB based Dyna Models car, instead of the Progress/Gallop. 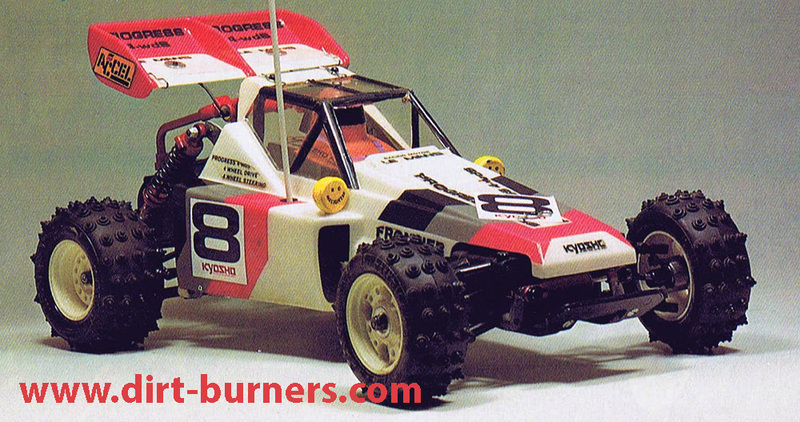 Without the Optima on the starting grid, the 1985 Worlds was dominated by the Yokomo 834B Dog Fighter. An Optima, in the hands of a seasoned driver, would most certainly had won the race, at least that is my opinion. You might disagree, as I’m obviously quite biased towards the Optima, but I honestly believe it would have been a real shocker in the Californian dirt. Akira Kogawa to the left, holding the Tomahawk he used in both the Modified and stock classes. Notice how it has the same livery as his new Optima in the picture above. Beside him is Toshifumi Watanabe with his Progress/Gallop for the Modified class and his Tomahawk for the Stock class. Ok…. enough about the Optima, and back to the Progress/Gallop that Toshifumi Watanabe raced to 87th place, beaten by Takashi Aizawa (22nd) and Keiichi Kikuchi (81st) with their Mugen Bulldogs, Masahiko Oda (62nd) with a Hirobo Zerda, Tadashi Kurihara (84th) with a Marui Samurai that had a habit of falling apart as soon as it hit the track, and by Kazuhiko Nakanishi (77th) in a Turbo Scorpion and Akira Kogawa (82nd) himself with his trusted Tomahawk. He was even beaten by Yoshiaki Shimotori with a Tamiya Hotshot! So I think it’s fair to say that the Progress/Gallop wasn’t much of a race car, as Toshifumi Watanabe was quite a good driver. This does not mean I don’t like the Progress/Gallop, far from it. 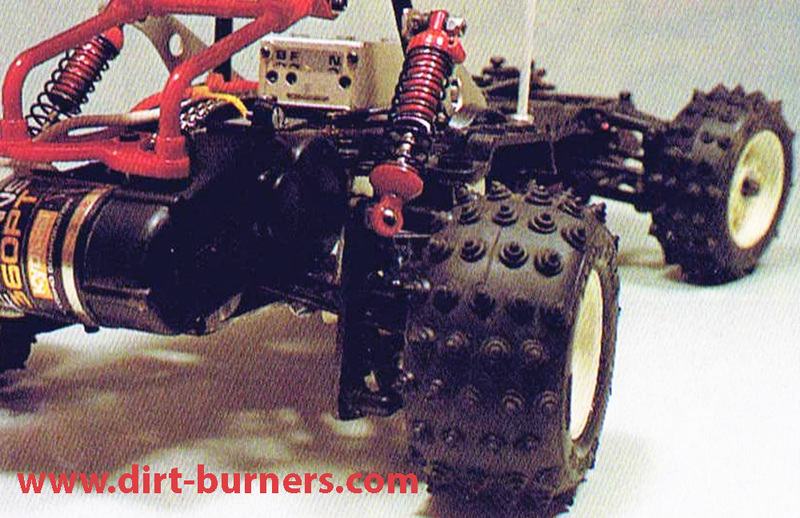 I think it’s darn cool, and it was Kyosho’s first 4WD electric off-roader. It just wasn’t a full blown race car. Watanabe’s Progress/Gallop hybrid was certainly a fine specimen, using the rear cage parts from the Gallop and the front part of a Progress body. Toshifumi Watanabe’s 1985 Worlds Progress/Gallop 4WDS. He also had the option of using either the Progress’ one-way front “diff” or the gear diff of the Gallop, depending on the track and surface. From what I have found, he used the Gallop diff at the Worlds in Del Mar, but I know he experimented with both options. There were also a few performance modifications done to his 4WDS, like removing the coil-over spring on the front mono shock, depending solely on the torsion springs. The original Progress/Gallop shocks were replaced by the red Turbo Scorpion/Optima versions. The coil-over spring was removed from the front mono shock, and the E-clip front axles were changed for rear axles, so the wheels could be mounted with nuts, the “normal” way. The lower shock mount positions for the rear shocks were also modified, by using small graphite plates that were mounted on the rear trailing arms, so the bottom of the shocks were mounted higher, for a different angle, thus giving a different shock action. Graphite plates were mounted to the rear arms to provide for a different angle for the shocks. 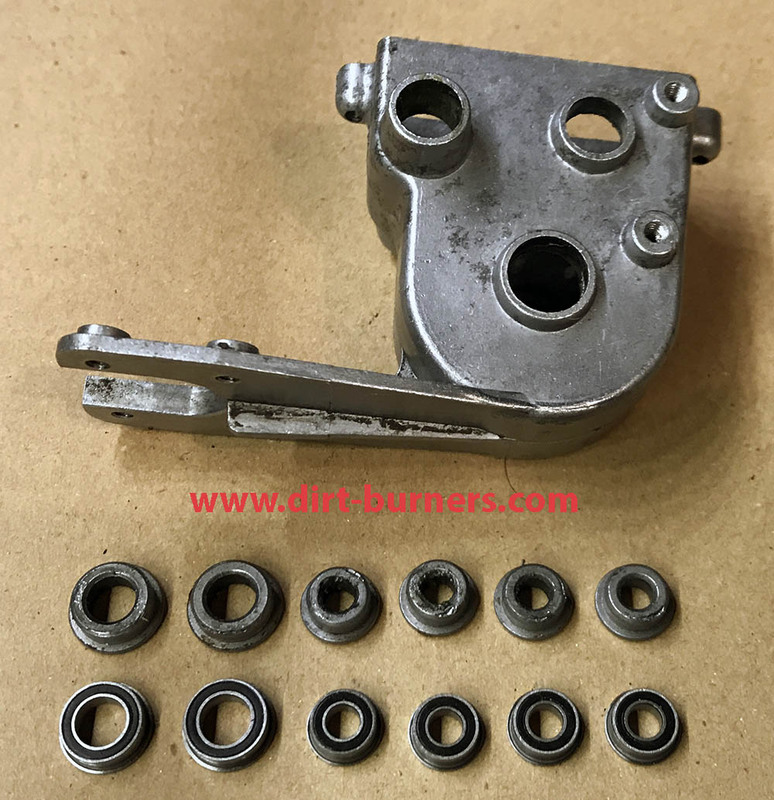 He had also dropped the stupid E-clip mounts for the front wheels, and replaced the front axles with rear axles, so the wheels could be mounted using nuts, like at the rear. 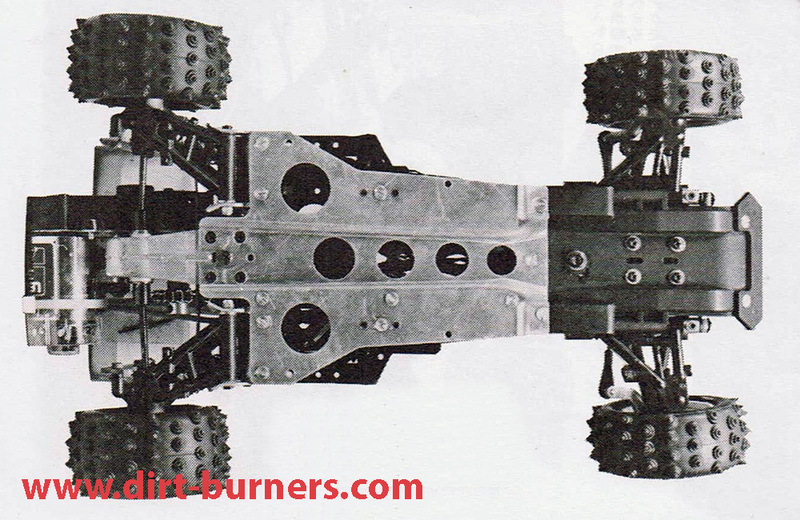 Additionally, the various chassis parts had undergone the “Swiss Cheese-treatment”, with holes drilled all over. Even the front wheels had been Swiss Cheesed, to reduce the unsprung weight. Holes were drilled in both metal and plastic parts to reduce weight. Even the front wheels were drilled. Like a lot of the Kyosho guys back then, Watanabe used Sanwa electronics, with a SM-346 Speed Controller 200 and a BB-HS, ball raced, high speed servo. The motor was a Le Mans 480T (the green one), although all pictures of the car shows the Le Mans 360PT, the “recommended” motor from the manual. 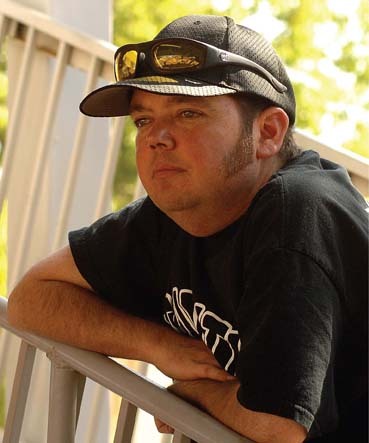 The 360PT was not legal at the Worlds due to the IFMAR rules, as it was a 550 size motor and not a 540. I do believe they were legal in some Japanese race classes. Sanwa Speed Controller 200 mounted high, to get cooling through the missing windscreen. The body was painted in Watanabe’s trade mark colors, a livery that undoubtedly inspired Joel Johnson, two years later. 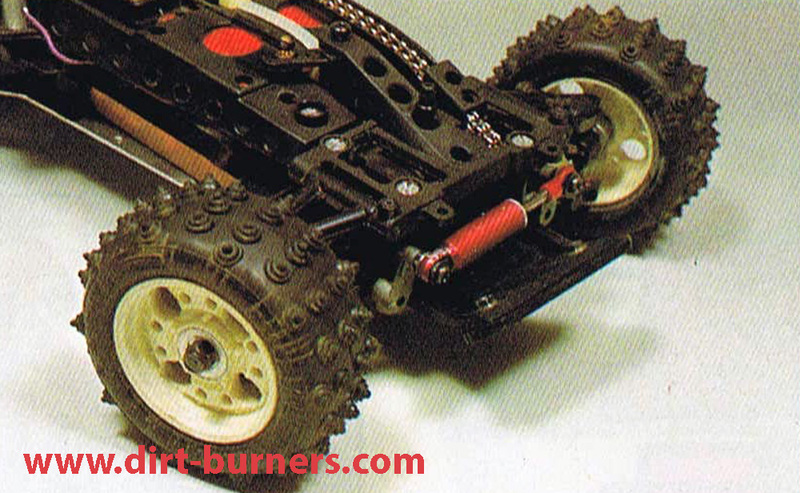 Talking about painted bodies….. Toshifumi Watanabe is in fact the artist behind some of Kyosho’s most famous box art body paint schemes, like the Turbo Scorpion, the Optima, the Turbo Optima, the Gallop Mk.II, and virtually every Kyosho model from that era. Watanabe san did them all. Toshifumi Watanabe, the Kyosho in-house box-art artist. I have quite a lot of different projects running at the moment, but waiting on different small parts makes me constantly want to start on new projects I have planned. I have for a while wanted to build a Watanabe Progress/Gallop, and when I found this Gallop wreck, I thought it was time to start. I got this Gallop wreck really cheap from Japan. The car was in a very bad shape, with lots of rusty screws and other metal parts. 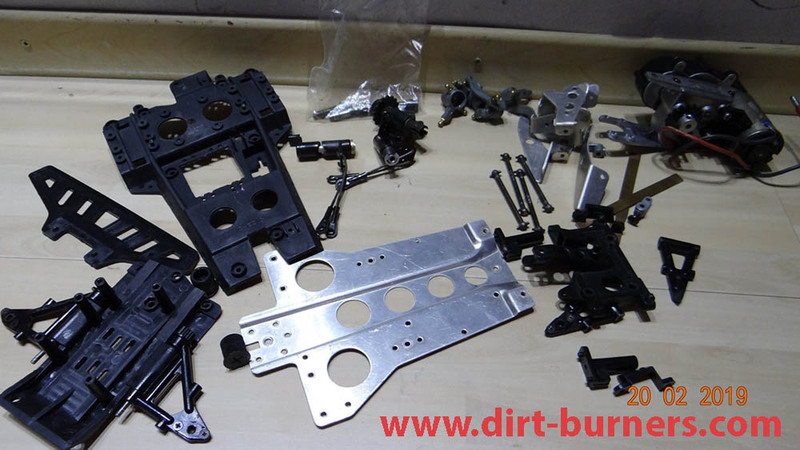 Luckily the important parts like the chassis and the gear box etc. were salvageable, and after taking it all apart for a good cleaning and WD40 treatment, it was time to change all the bushings for ball bearings. The bushings were press fitted, but actually much easier to pry out than what I have earlier experienced with eg. Scorpion gear boxes. Bushings removed, and gear box ready for cleaning and ball bearings. The gear box and the front diff mount were also carefully shimmed to remove any sloppiness. The gear box is now silky smooth, and a huge difference from the gear box on my standard Gallop. There were quite a few broken and/or missing parts on the wreck I bought from Japan, most noticeably the front left steering hub, front dog bones and axles, as well as rear wheels. There were one rear wheel coming with it, but it fell to pieces when I tried to remove some big chunks of glue. There were no tires either. Most of these parts I have NIB in my “inventory”, like axles, dog bones, steering hubs, motor cover, both front and rear tires etc, but I also decided to buy a small lot of used parts from Sweden, with the help from Filip Williamsson, that includes a full gear box, chassis, and a lot of small parts, as well as a Progress front “spool” that is different from the Gallop front diff and case. I will choose the best parts from the Japanese donor car and the Swedish lot. What the donor car did have, was the rear part of the cage, including that infamous rear cage support plate. This was perfect, as these are the only parts of the cage that is used on Watanabe’s car! The parts lot of Progress parts I bought from Sweden with the help of Filip Williamsson. Wilhelm Pantring from Germany kindly donated a pair of rear wheels for this project. Thanks a million, Willi. The under side of the Watanabe Progress/Gallop, with the mini bumper. Then it was on to sourcing the electrics. I do have a LeMans 360PT for the project, as well as lots of different vintage Sanwa receivers. The receiver is “buried” inside the car, and I have not been able to find any info on which exact model Watanabe san used. I will just pick one of those I have. One that will be correct for a 1985 car. The Speed Controller 200 is VERY rare, and not easily found. I have been trying to source one for a while, but the only one I could find was a blue rebadged model that Bart Loomans in Belgium had. It was rebranded for the Belgian distributor, and anodized in a beautiful blue colour. But since the ESC is so central and easily spotted on Watanabe’s car, I decided to continue the search for an original silver one. Then all of a sudden, Mike Haswell in England sent me a PM with a link to a Japanese auction. The auction was ending in less than half an hour, the leading bid was at around 3000 Yen, and it steadily went up by the minute. Luckily there was a BIN option at 5000 Yen, so I just skipped the whole bidding game and bought it directly. I got it quite a bit cheaper than I had expected to pay for such a rare ESC, anyway. Then it was just the servo missing. The servo was only partially visible in a couple of the pictures, but from what I could see, it looked nothing like any of the many vintage Sanwa servos I have. 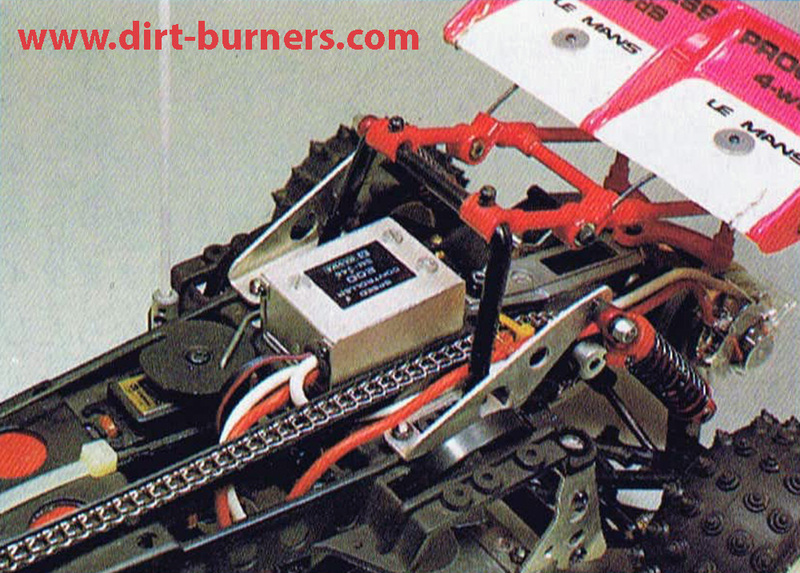 I put the picture up in a few Facebook-groups for help, and it soon was clear that the servo was a BB-HS, a high-grade, high-speed competition servo. I haven’t been able to find the exact model, but Jerry Hellström in Finland found a BB-H, a visually identical model, but with a higher torque. I decided it had to do, and Jerry kindly agreed to sell it to me, removing it from one of his cars. Well, that will have to do for now. Next is starting the “Swiss cheese process”, and making the custom parts. More to come. Thank you so much for this great articles of yours! You are certainly not alone in your passion for this great hobby of ours. I am 52 years old and in love with it since I was 14 and going stronger every day. You are truly inspirational for collectors and always a pleasure to read about your various projects and detective skills. Again, thank you so much! Thank you for the kind words, Jose! Thanks for writing this very interesting article. Also, I have never seen a photo of Akira Kogawa’s Optima before. It seems his green Tomahawk is well documented and was on display at Kyosho’s hobby show stand when the Tomahawk was released but I wonder if the Optima still exists? Good question, Brian! I’ll see what I can find about that. I know he has used his old Tommy for some vintage races, but I have never seen him using the Optima.